Scientists in the cryospheric sciences focus on understanding the role of the polar regions in global climate and sea level. 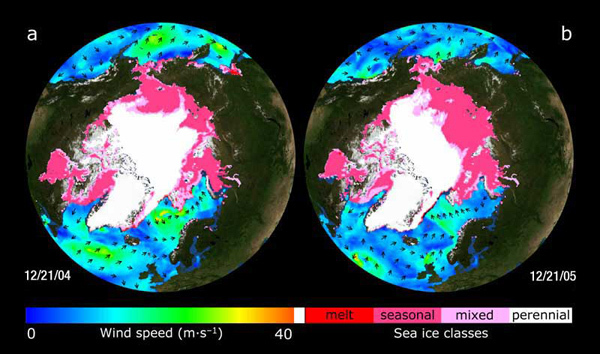 Researchers have made use of GRACE, QuikSCAT, Synthetic Aperture Radar, ICESAT, and new modeling techniques to track changes in the cryosphere. 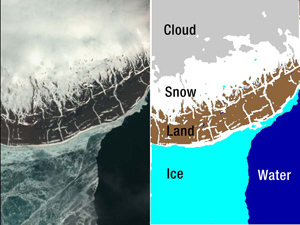 QuikScat interannual observations of (a) wind speed and (b) sea ice over the Arctic have enabled the detection of recent drastic reduction in the extent of perennial ice and its depletion from the eastern Arctic Ocean. On the left, Resolute Bay seen by the Hyperion instrument aboard Earth Observing-1. On the right, a visual representation of the analysis done by JPL's new software. The Space Technology 6 Autonomous Scientific Experiment tracked changes in the Spring Thaw using new onboard software developed by JPL engineers, software which distinguishes among water, ice, and snow. Such studies continue a tradition of studies at JPL that found evidence for earlier regional thawing, at a rate of almost one day per year since 1988.